St. Catharines, Ontario is home to the only all suites Four Points by Sheraton. Featuring 129 suites, ranging from 550 – 1150 square feet in size, the Four Points St. Cathrines provides all types of travelers with the best accommodations in the Niagara Region. All the best in Niagara wineries, golf courses, restaurants and attractions are only a short drive from this spectacular St. Catharines Hotel. For the business traveler, corporate headquarters, such as General Motors, Dana, TRW, Abitibi & Brock University are all near the Four Point by Sheraton Niagara Suites. 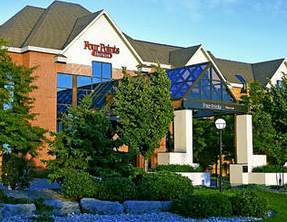 The Four Points by Sheraton St. Catharines Niagara Suites is a 129 suite hotel located in St. Catharines, Ontario. This is the only all suites Four Points available, and provides the ideal accommodations for all types of travelers. Each suite consists of a private bedroom with a king or queen size bed or two double beds and a separate living room with sofa bed and dining table. The Four Points by Sheraton boasts some of the best hotel amenities with complimentary High speed Wireless Internet throughout the hotel, room service, in house all day dining at In Piazza Pasta & Wine Bar, indoor heated pool, Jacuzzi, Sauna, Fitness Canter, game rooms, & outdoor recreation. This Niagara Hotel is only a short drive from the St. Catharines attractions, Niagara Regional Golf Courses, Niagara Award-Winning Wineries, the Falls, Niagara Falls attractions and the best restaurants in the region. The Four Points by Sheraton also provides guests with 11,000 square feet in meeting space from 10 full service rooms. The casual dining available in this luxurious hotel is In Piazza. Open from 6:30 am – 11:00 pm, this Italian style restaurant features all day dining indoors or seasonally at the outdoor patio. From old time favourites to daily specials, this St. Catharines restaurant offers a mix of regional & Italian dining that will satisfy all guests of In Piazza Pasta and Wine Bar. The Four Points by Sheraton St. Catharines offers 11,000 square feet of flexible meeting and banquet space, including 9 full-service function rooms and a grand ballroom. The Grand Ballroom connects to the outdoor patio, which provides the perfect area for a wedding ceremony. This meeting space at the Four Points Niagara Suites is able to accommodate any type of event. Each of the meeting rooms provides guests with individual temperature controls, on-site AV equipment, complimentary wireless internet and solid walls.